As soon as I saw these photos from the Madewell spring lookbook, all shot in Paris, I instantly thought about our upcoming trip and the fact that I'm going to be packing two weeks worth of clothes into one small bag. Doesn't this looks like the perfect mix-n-match wardrobe? Lots of easy layers, neutral colors and flat shoes for walking. Now if only I could figure out how to braid my hair like that! This is one of these "universe, make this wardrobe happen for me" posts. Gorgeous! I've said it before and I'll say it again: Madewell is the best. They have yet to design a piece of clothing that I didn't want in my closet immediately. That first outfit is especially great. would love this for summer as well! If you ever DO figure out how to braid your hair like that, be sure to tell the rest of us. I very, very much love the outfits. 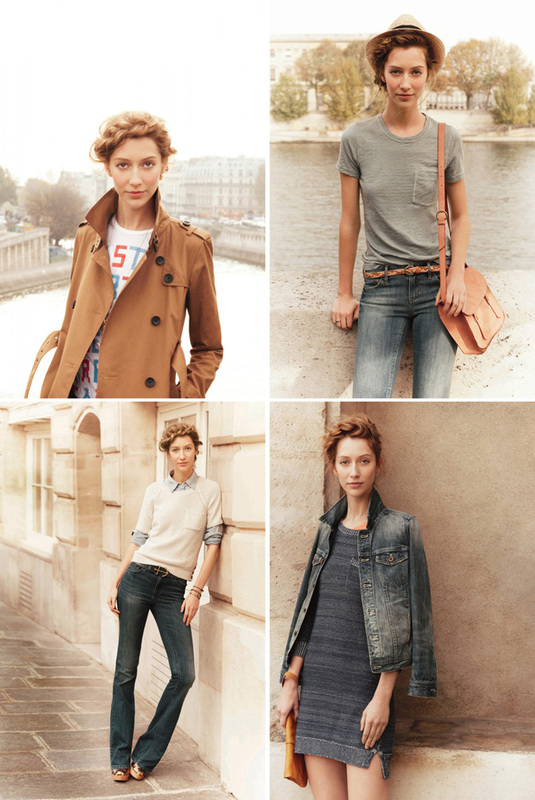 Madewell is freaking awesome. I got their catalog in the mail the other week and can't keep myself from ogling it every so often. These are such great, effortless looks. I want that first stripped so much! If only I lived in the states! Love those pics. And the beautifu hair!! Love those pics! And the lovely hair! !